The Coca Cola Scholarship is an annual scholarship program offered by the Coca-cola foundation to high school senior graduating students. Each year, the Coca-Cola Scholars Foundation sends 150 bright, young innovators, leaders and game-changers into their lives beyond high school with a head-start toward achieving their goals. The Foundation has supported over 6,000 Coca-Cola Scholars with more than $66 million since its inception. 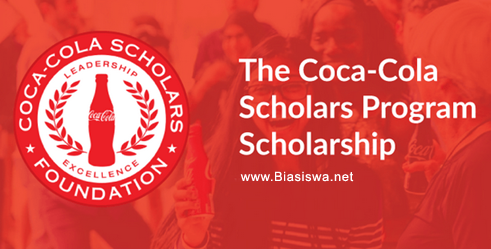 The Coca-Cola Scholars Program scholarship is an achievement-based scholarship awarded to graduating high school seniors. Students are recognized for their capacity to lead and serve, as well as their commitment to making a significant impact on their schools and communities. Scholarship Value: $20,000 will be shared among the 15 Scholars selected for the year. Course Level: Scholarships are available to graduating high school seniors. Study Subject: Scholarships are awarded to study any of the subjects offered. Nationality: This scholarship is available for US citizens. Number of Scholarships: Up to 150 scholarships are available. Applications Deadline: October 31, 2018 at 5:00 p.m. Eastern. To be selected as a Coca Cola scholar, you must meet the requirements below. Children or grandchildren of employees, officers, or owners of Coca-Cola bottling companies, The Coca-Cola Company, Company divisions or subsidiaries. All applications must be done online. But before you go ahead with application, We advise reading the information below so you can be fully prepared. The 2018-2019 application has been revamped for this year's cycle to make the user experience easier and more efficient. We hope this new format will allow more applicants to complete the application and give the Foundation a better understanding of their high school success. A high school transcript - There is no need to upload, email, mail, fax, or submit in any other fashion, a copy of your transcript. While completing the application, you will be asked to type in your specific grades since your freshman year and their course levels. Having your transcript nearby will help you fill in this information. Contact info - The names, email addresses and phone numbers of your guidance counselor and principal. A list of employment during school and during the summer. You will need to know weeks and hours worked. Collecting this information will help you complete the online application. We do not request nor accept any supplemental information, including high school transcripts, letters of recommendation, essays, personal statements, head shots, or any other items outside of the online application. Any item mailed, emailed, or faxed to the Foundation will be recycled. Click link below to start your application. This application functions in both mobile and desktop versions as well as across browsers. For the best user experience, we recommend Chrome, Explorer/Edge, or Safari. Visit Scholarship official portal for more information.